Gotham City is overrun by Jokerized victims, and The Joker himself is prowling the streets. Even as Batman confronts the Clown Prince of Crime, ordinary citizens and Arkham inmates must confront the mark The Joker has left on the city and themselves. Is anyone truly safe? 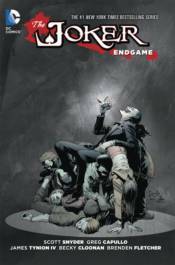 This jam-packed collection features stories from BATMAN #35-40, BATMAN ANNUAL #3, GOTHAM ACADEMY: ENDGAME #1, BATGIRL: ENDGAME #1, DETECTIVE COMICS: ENDGAME #1 and ARKHAM MANOR: ENDGAME #1.